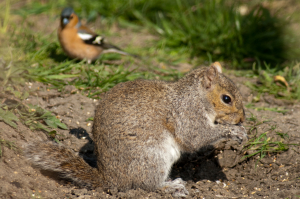 Observation - Grey squirrel steals the limelight .... and the seed - UK and Ireland. Description: Did start off as a photo of the Chaffinch! Did start off as a photo of the Chaffinch!